The ALI EKINCI loading scrap metal in Tilbury. She is registered in Istanbul. More info. please RWJ.. Photo taken 4/97. This bulk carrier started life as the Greek-owned WORLD PEARL (23,436 tons gross, 37,415 tons deadweight) and was built in Japan in 1982. 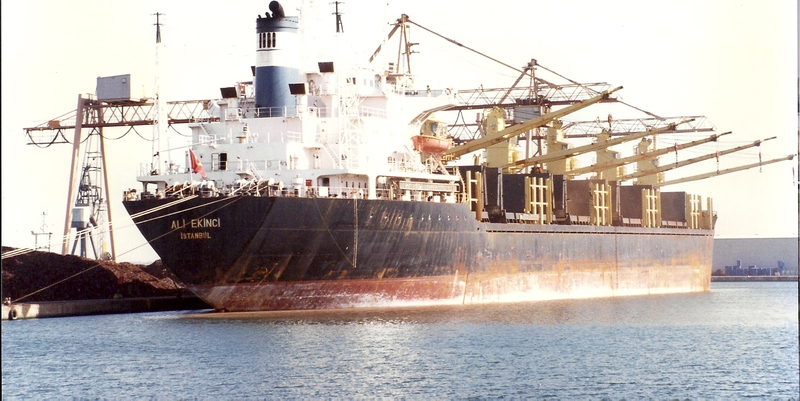 Following a change of owner and a change of name it became ALI EKINCI in 1995, owned by Gemik Shipping & Trade Inc, of Istanbul. She traded successfully with Gemik for over 15 years and was sold by them in 2011 to become the Greek-owned STEEL ANDRONIKOS … a short-lived name, for in less than a year she was at a scrapyard in Bangladesh.